This essay argues against a proposed change to grading practices. I just want to say a few things about the talk that’s been going on around this school abot changing the ways were graded. School would not be any easier if grades were based on effort instead of by how many a student got wrong or right. Sure it sounds like a good idea at first, but it isn’t really a good idea. If grades were based only on your effort, students would not have to get the answers right. It would make the work a whole lot easier, but how would a student ever learn how to do it? Doing your work would have no piont. They will need to know how to do things the right way if a person does have these skills, they probably won’t hold a job very long. Students have to learn that their is a right way and a wrong way. If they can work which ever way they want, they will not be doing it right and that they will not learn how to be succesful. This way of grading would be difficult for both the students and teachers. There is no real definite way of measuring how much effort a student has put in. The teachers would have to get used to a hole new method and they would have to figure out some way to grade the students based on effort. It would also not be fair to the students. Plus one teacher would have a hard time watching everyone in the class work all at once. So you can see that if this did happen, both the students and the teachers would have a much harder time. It would not help anyone who planned to get a job. Because it does not teach the students how to do things the right way. Next time you think that this would be a better way of gradeing, think again. 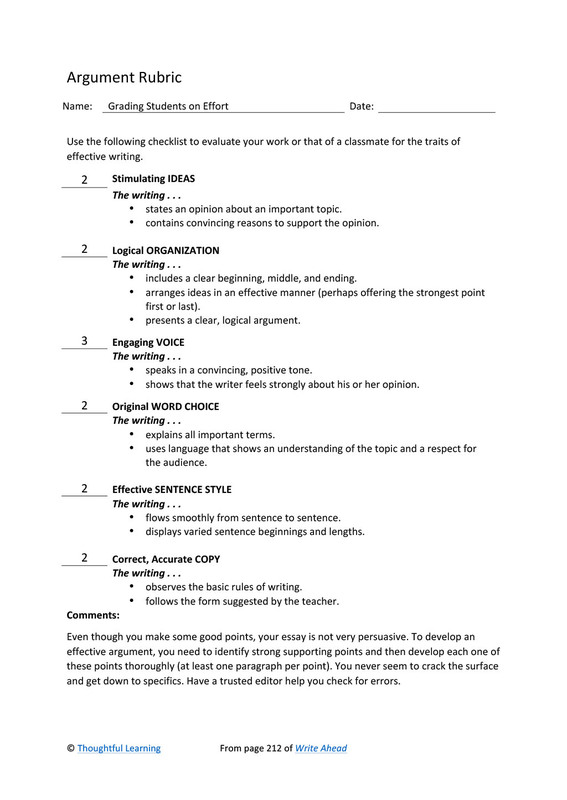 Grading Students on Effort by Thoughtful Learning is licensed under a Creative Commons Attribution-NonCommercial-ShareAlike 4.0 International License. Based on a work at k12.thoughtfullearning.com/assessmentmodels/grading-students-effort.